In addition to the celebrated Big Three devices, Max for Live includes a set of MIDI Effects that provide examples of various kinds of operations and processes. You can use these patches in series in your Live sessions, or edit and recombine them to make your own devices. Click on a File button in Live's File browser and choose Library from the pull-down Bookmarks menu to show the Library. Click on the arrow to the left of the folder marked Presets. Click on the arrow to the left of the folder marked MIDI Effects to show the folder's contents. 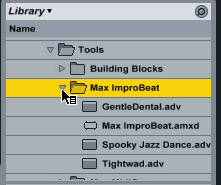 Click on the arrow to the left of the folder marked Max MIDI Effect to show the folder's contents. Click on the arrow to the left of the folder marked Tools to show the folder's contents. The example devices are listed in the Tools folder beneath the Building Blocks folder. Each example device is contained in its own folder, along with a number of presets.